The Emergency Laparotomy Collaborative (ELC) started its implementation phase in September 2015. The two-year quality improvement project is a collaborative project between West of England, Kent, Surrey and Sussex and Wessex AHSNs with the aim of accelerating the spread of a care bundle that aims to improve standards of care for patients undergoing this surgery, reducing mortality rates, complications and length of stay in hospital. 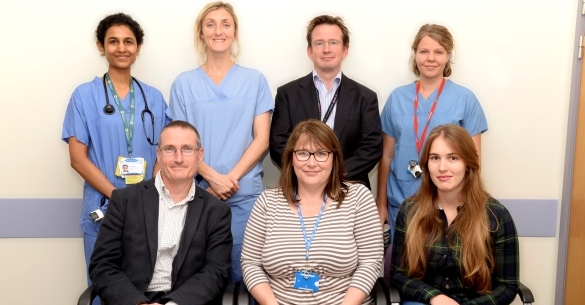 Great Western Hospitals (GWH) NHS Foundation Trust in Swindon is one of the six trusts represented across the West of England who have been doing some great work on improving the standards of care and outcomes for patients undergoing Emergency Laparotomy Surgery. “Since the establishment of the National Emergency Laparotomy Audit (NELA) database we have been keen to improve the management and outcome of these patients at GWH. The ELC has been an ideal way to promote six fundamental steps in the patient pathway that we can improve to make a difference. Starting with tackling early sepsis screening, recognition and treatment on the Surgical Assessment Unit, we have incorporated the screening tool in to the admission proforma and improved completion rates. Secondly we have improved preoperative risk scoring by presentation of runcharts from the NELA data and encouraging surgeons and anaesthetists to use it to influence ongoing decision making such as Consultant presence in theatre and post op ICU. The easy way runcharts can be produced from NELA data is a real bonus in sharing successful improvement and rapidly communicating when performance drops off. Most satisfying of all has been the policy of admitting Emergency Laparotomy (EL) patients to ICU. Almost 100% of our EL patients come to ICU and this practice is supported and encouraged by all from anaesthetists, ICU staff and bed managers alike. It is now embedded practice and the improvements we have seen in mortality is most welcome. Figures just released show that the length of stay for those patients who survived to discharge has dropped by 1.9 days overall.